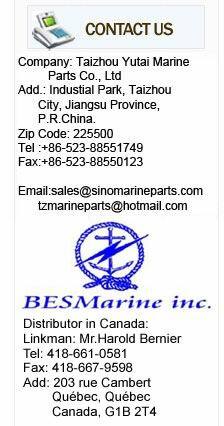 Taizhou Yutai Marine Parts Co., Ltd is a group of Marine Instrument, Marine valve, marine Parts, etc. in Mainland China. Our products have been approved successively by the international major Marine Classification Society: CCS, LR, GL, ABS, DNV, NK, BV, RS, RINA, KR, ETC. and we can provide customers with the product certificate issued by any of the above Classification Society. All our products are sold well throughout china and exported to various countries and regions such as Japan, U.S.A, Singapore, Korea, West Europe. And Middle East, etc. They are warmly welcomed by overseas Customers. If you are interested in our products. PLS contact us directly.